What would my grandmother say if she watched as her nation went up in smoke? I can just hear her crying out to me as I sleep…. Where have the Boer, Anglo and Afrikaner warriors gone? Why has Western European man stood idly as so many have taken advantage of his kindness and altruistic nature? In my adopted homeland of Britain and other northern & western nations our men watch as radical Islam, mass immigration from Africa, the Mideast and the ‘new EU’ has decimated their nations with crime, cultural infection and hatred. I ask- when will we rise up and defend ourselves? Firstly I’d like to say that I am not a racist. In fact I have at times been sympathetic to the plight of the black man due to the fact that as a district nurse, I am often sent to assist children stricken with tuberculosis living in Capetown’s poorest townships. As a human being it is hard not to feel sorry for these children, regardless of their skin colour. I feel for all people, was actually against Apartheid as a student, and count several ‘coloured’ people as close friends. One of my great grandparents is in fact ‘coloured’, as is often the case in South Africa. So this has NOTHING to do with racial hatred. My anger at how far we have fallen as a people-how complacent; even cowardly we have become at times, stems not from hate, but tragedy. You see I lost a loved one due to anti-white racial hatred a few years back. My 19-year-old cousin was gunned down for his mobile phone and murdered – in my opinion, solely because of the colour of his skin. Jaco was with a group of his friends on a night out when they were set upon by a group of black males. The black thugs attacked my cousin, used racial epithets, shot him at point blank range and walked off with a handful of cash and a cheap phone. Making matters worse was the fact that Jaco’s friends left him to die, even when the blacks had run off. Not one retuned to the scene of the crime. Not one. His cowardly friends did nothing, leaving him to die. His death is a metaphor for the death of our collective societies. It pains me to write this, and I certainly mean this with no disrespect, but what has happened to the archetypal Anglo-Saxon/Germanic European male? Have we become so selfish we no longer care for our fellow man? The western man, once revered and feared for his bravery in battle, and willingness to combat evil, has stood idly while pathetic black nationalist movements have raped and killed his daughters, sisters and mothers in South Africa. Members of our own community, men like the EEF’s Wiekus Kotze and Jaco Oelefse, have joined forces with the enemy to enrich themselves. A long line of Afrikaner men and women like Sue Van der Merwe, serve the ANC, and actively fight against the wellbeing of their own community. Others like Charlize Theron and her murderer mother do so from abroad. In my adopted homeland of Britain and other northern & western nations our men watch as radical Islam, mass immigration from Africa, the Mideast and the “new EU” has decimated their nations with crime, cultural infection and hatred. Men are angry that their streets are flooded with non-British people, but do little to stem the tide of immigration. Therefore, I ask respectfully, what has happened to us? Why have we fallen to such a degree? Why would a group of white males not think to come back on check on their fallen mate? And why has Britain still not had a referendum on its membership in an organisation destroying its national sovereignty – the EU? It is the same reason we are on the brink of extinction our lives are in danger every day we leave our gated communities-those of us fortunate enough to live behind walls. In South Africa, men like Julius Sello Malema, the leader of the Economic Freedom Fighters, a Marxist Black Nationalist movement, has increased in power because of OUR own apathy, as much as ANC complicity. In spite of the fact we own the vast majority of the businesses, control most of the economy and have support in white, Indian and now coloured (EKP note-coloured is the appropriate term for Mulatto people living in South Africa) community, we have made little inroads into the ANC’s political stranglehold and done almost nothing to challenge people who threaten our very existence. The ANC have dominated us to such an extent, we pander to them, instead of challenging them. 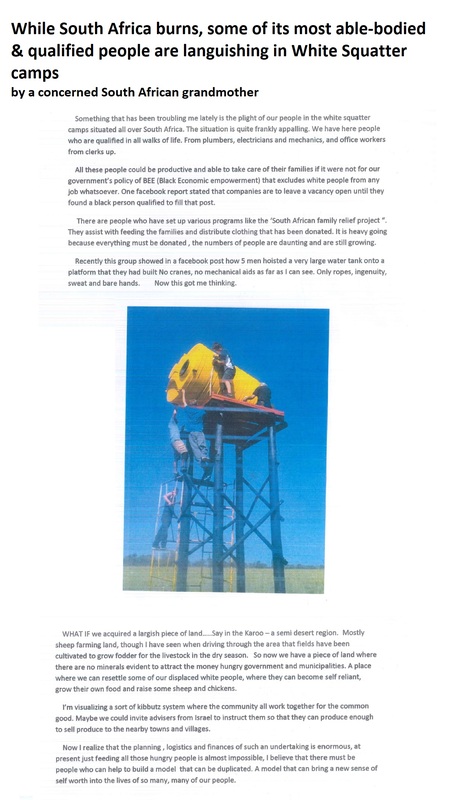 Our weakness has empowered them to such a degree, that elements of their party (the EEF and black nationalist factions) have radicalised against our own, and South Africa’s national interest! I, along with my friends at the EKP, am all but certain that it wont be long before Malema, who like a Witdoodshaa (Great White Shark) smells both blood and weakness in our apathetic response to his ascent, starts inciting violence against South Africa’s non-black population. One need only look at the fact that in recent months, internationalist racist groups, like the American Black Panthers have been welcomed into South Africa with open arms, where they have called for the murder and extermination of ALL non-blacks. Instead of preventing hatred, the ANC and radical EFF, have embraced the hatred. If you haven’t read the article on the Black Panther’s recent racially motivated visit to Johannesburg, I’d advise you do. And, What have we done in response to the recent Black Panther visit that called for ALL of our deaths? South African women, as I myself once also had to – are forced to live behind bars, their kids kept inside and no one, I REPEAT no one, is doing anything to change it. Sure there are internet warriors amongst us, that tell black racists how we are going to ‘kill them’, call them ‘baboons, and state that if they ‘f^%$ with us”, we are ready to ‘bring it’. I see men calling themselves, ‘Viking Son’, hiding behind profile photos depicting Game of Thrones characters, write all sorts of racist foolery. What I rarely see or hear about however is actual men standing up for their families. When’s the last time, besides in the instance of the Black Axe Man, the Rugby star that decapitated men he perceived as threats to women, you heard of vigilante justice in South Africa? Tens of thousands of people have lost their lives, and we have thus far brought absolutely nothing but pay lip service to the carnage. The sort of people that are supposedly fighting for ‘our’ rights are not the men we need to start addressing the issues we are facing, just fools hiding behind their computers in places like Alabama and Mississippi, thousands of miles removed from South African Ground Zero. Online posturing from delinquents in the American south isn’t going to help any of us. We need people who genuinely care about their respective societies, who aren’t racist simply for the sake of it, but are acting on love, honour and decency-good men that recognise that we are under attack and that THIS is the time to act. Ask yourself if you think your grandfather would have sat idly and watched his people attacked. While innocent whites, Asians and coloured women, who contribute to the betterment of the country, have to live in fear of being raped, while hell raising black African racists and radicals do as they please. The Northern man has a long history of doing what’s right and reversing wrongs perpetrated by his own actions and others-where is he now? And pray tell- why are so many or our young men now aligning themselves with political parties that hate us! Traitorous wretches like Wiekus Kotze (pictured above) and Sue Van der Merwe come to mind. Literally tens of thousands of French, English, and Western European Muslims, living on European soil, have heeded the call and travelled abroad, where they have armed themselves and committed atrocious acts of terror against innocent civilians and our soldiers. Instead of demanding that we immediately revoke these traitors citizenships, we have stood still, watching the carnage unfold while we dedicate our time to watching football and the X-Factor. At home radical Islamists and members of ISIS have also called for Muslims in the UK to rise up and kill innocent British non-Islamic civilians in the name of Jihad. Only a few brave men in a loosely organised EDL, and members of a radicalised Sikh & Hindu anti Islamic movement have voiced their disapproval. Both have been lambasted and subseutnly shouted down by the Left for doing so. Most western men have remained quiet in fear of being branded racist. Doesn’t anyone else see a problem with this? Recognise, that of all the nations on Earth, Britain, South Africa and our comrades in the US, should have had the greatest resolve when faced with adversity? You raped someone’s daughter a hundred years ago, there’d be a lunch mob in town. Today, no one gives a damn. Lastly, I am writing this from the perspective of a woman that had to leave South Africa for Britain. A woman with both Anglo and Afrikaner heritage. I would like to take this opportunity to bridge the gap that still exists between our two communities. Enough is enough. For those of you unfamiliar with our shared history, Brits and Boers fought on opposing sides during the Boer Wars/Vryheidsoorloë during 1880–1881 and 1899–1902. Today we live in lands divided by nearly 6000 miles of land and sea and although we are very different people, we share something unique-the great Northern spirit that has made our countries what they are today. Although we are ashamed to discuss our greatness, and that which we share, I am not. In Sir Arthur Conan Doyle’s text The Great Boer War, and then later in his diaries, the renowned English author describes the Boer as a people so fierce, the British army had no choice but to take notice. He opined that one Boer soldier was the equivalent of a ballatalion of Frenchman, and of more value than the entire Spanish army! Though his words are hyperbolic, we can quite easily recognise the immense amount of respect Doyle had for Britain’s Boer adversaries. “What is British policy?… To wage war against a monstrous tyranny, never surpassed in the dark lamentable catalogue of human crime. What is our aim?… Victory… Victory at all costs. Victory in spite of all terror. Victory, however long and hard the road may be. For without victory, there is no survival…For we are English and we know only victory!”. Regardless of your opinion of Churchill, no one can deny that the British Empire was the greatest of its kind since ancient Rome. Controlling more than one third of the worlds land mass is no small feat and speaks volumes about the strength of character and will! That is why I ask you: what would these two great men say about us today? How would men like Churchill and Doyle perceive men that have allowed the morally and spiritually bankrupt left con them into allowing our nations to be snatched from underneath us by people of such little worth? Like my father, who actually fought in the Boer Wars, they’d roll over in their graves. Yolandie Woudsma was born in Benoni in 1939 and moved to Britain with her husband in 1993. She is a regular contributor to the EKP, however this is her first featured post. If you enjoyed it, or didn’t please feel free to let us know. Again. where have our warriors gone. Please sign up for the EKP newsletter at the top of the page so I can reach you again when I am next inspired to write.